​Things are not always as they first appear. Children learn this when they become young adults and experience the labor and sweat that was required of their father to put food on the table when growing up. As a child this is taken for granted: reality has not set in yet. At varying junctures in the Holy Bible, God’s people are allowed to see the realities of this world as they really are. There is more at stake, the enemy is more deadly, and the Father is more powerful and than the Christian may realize at 6 AM when wiping sleep out of the eyes. Wipe away the sleep and wake up to the reality of what it means to be in God’s presence: in His living room as it were. ​When we speak of God’s living room, we use contemporary language to describe God’s temple, His dwelling place, or His presence. Throughout scripture, to be in the presence of God is a special event. Wherever God appeared in history became known as God’s dwelling place, and that place became sacred and reverenced. Consider the following examples: Jacob’s vision at Bethel (Gen. 28:10-22), Moses at the burning bush (Exodus 3), God’s descent on Mt. 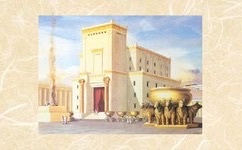 Sinai (Exodus 19 & 33), and God’s dedication of the Temple (2 Chron. 5-6). These events compose a short inventory of windows through which to gaze at the glory of God. While gazing through these windows of revelation, may God’s holiness radiate, may first impressions disintegrate, and may your level of reverence in God’s presence elevate. ​Fine attention to detail is stressed whenever man stands in the presence of God. Notice how Moses was told by God to remove his sandals while in the presence of God (Exodus 3:5). In ancient times and in the East still, this is a gesture of respect and humility. When preparing to approach God’s glory on Mt. Sinai, the people were to wash their clothes of all impurities (Exodus 19:10), abstain from intimacy with their spouses during the days leading up to the event (Exodus 19:15), refrain from touching any part of the holy mountain (Exodus 19:12-13), and resist the urge to look at the brightness of God’s radiating glory (Exodus 19:21). When God appeared to Isaiah in visionary form, Isaiah was shaken with fear (Isaiah 6:1-5) and it was necessary that he be purged of sin in order to stand in God’s presence (v. 7). A similar picture is detailed in Revelation 7 as John looks into the heavenly throne room of God and sees God’s faithful standing in “white robes,” (v. 9). John would later explain these white robes represented the “righteous acts of the saints,” (19:8). Truly it is no trivial event to enter the living room of God. ​The application from these revelations of scripture is abundant. For sake of space, answer this one application question, “How should man approach God’s presence in worship?” The church is called, “the house of God,” (1 Timothy 3:15) and, “the temple of God,” (2 Cor. 6:16). In both Paul’s address to Timothy and Corinth, Paul was addressing the church collectively, not individually. It would seem whenever the body of Christ, “comes together as a church,” (1 Cor. 11:18) this is a special event. While as Christians are individually God’s property (James 1:1) and He is supposed to be the center of the Christian’s life (Matthew 6:33), God is not present in an individual’s life in the same sense as He is described to be present whenever the church collectively comes together as the temple of God to reverence the King of Kings. The bottom line of all this is simply put- whenever the church comes together to worship, it is not to be approached casually. The modus operandi of modern church culture is to present worship as casual. A preacher is measured fitting by whether or not he wears muscly t-shirts or stylish flannels. The masses are encouraged to come worship God on reclining couches, wearing only the most comfortable shorts and flip flops, all while getting a refreshing frappamacchiatoccino at the coffee bar. Furthermore, it would seem God is only in His temple on Sunday morning, and He is somehow absent like Baal every other day of the week (see 1 Kings 18). Is this the blueprint in scripture for approaching God’s presence in His dwelling place? Should Christians pay ready detail to relaxation or reverence when preparing for worship with the church? Should the Christian busy him/herself so much so that Sunday morning is the only block of time he might suffer to approach God in His holy temple? ​This message is in no means meant to be read spitefully or with a spirit of derision. Answer the questions above honestly and examine yourself. May our response to God be that of Isaiah, “Woe is me, for I am undone! Because I am a man of unclean lips…” (Isaiah 6:5). May God be reverenced to the uttermost by all men but especially by those who say, “You are my God!” To God be the glory. ← What Does God Care About?